I recently chaired a panel on customer centricity: 'Internal v External - promoting innovation in HR to build a consistent leadership brand'. The panal featured Ben Bengougam from Hilton Worldwide, Jill Brady from Virgin Atlantic, Simon Lloyd from Santander, Lynne Weedall from Carphone Warehouse and Angela Williams from British Gas. We were under Chatham House rules so there's a limit to how much I can post about the event, but it was a really interesting session, and I thought I should pull out some highlights for you. The most important thing is for an organisation to be clear about what it's trying to do e.g. how much customer alignment does it want. As I've blogged previously, I think you can take things too far e.g. innovation is more likely to come from unusual sources, not from customers. You probably need a mix of levers: people, culture, leadership, technology and measurement. There will need to be a link between your candidate / employer brand and your corporate / customer brand. Additional challenges to deal with? Good customer service increasingly relies on personality and emotional resonance - all more difficult to provide in a call centre environment, particularly if its off shored or outsourced etc. All this is becoming more important as everything becomes more social, e.g. as customers talk more about their experience using social media (see Josh Bernoff's Empowered). I mentioned United Breaks Guitars for Jill's benefit, and Twelpforce for Lynne's. There was a lot of support for the people first idea. I really wish I could post more on what the panel members were saying. And I wish even more strongly that this was a more broadly accepted paradigm. But basically we need to create the right culture and environment (human, social and organisational capital) internally to create the right relationships with customers. I was surprised how much social media came up. HR people may not be using social media themselves (I was the only person to check-in to Altitude 360 at the Millbank Tower on Foursquare, nobody was using Twitter - hard I know when there are Chatham House rules) but many do understand how much social media has changed things. Measurement got a lot of attention too, for example several members of the panel were using the Net Promoter Score for employees as well as customers, and we also referenced Gallup's Human Sigma. A great session - well done TEN (The Executive Network), panelists and attendees! There was some interesting research out a few weeks ago from Epson and CEBR suggesting that the average UK office worker wastes 2 hours and 39 minutes in meetings every week. 11 minutes: the average amount of time it takes for people’s attention to drift in a meeting. Nothing too surprising about any of this, other than perhaps how low some of them are (people concentrate in meetings for 11 minutes at a stretch – really???). Anyway, I’ve got an article in Management Today providing some suggestions for dealing with this problem. The last one’s my favourite! There’s a bit more detail on Management Today. The best of these I thought was one on Ulrich – and beyond, presented by Accenture and providing some early insights into some research they’re doing currently (there’ll be a book). Making hybrid the new market, eg a company might outsource to support growth in emerging markets but keep activities in-house elsewhere, or develop other, lower services to support the rising contingent workforce. Making all this work through ‘ruthless measurement and analytics’. This to me is absolute garbage – worse than that in fact as it’s not just useless, it’s also hugely dangerous as it’s just going to drive HR’s focus to more measurable activities which are generally less valuable. The biggest point for me though is that actually the whole debate is a red herring. Ulrich never proposed ‘his’ model as a solution organisations should implement. And it should never be one. 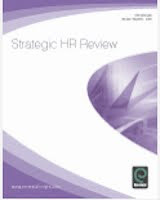 All organisational transformation, including HR’s, should begin with clear organisational principles, the identification of potential options and the comparison of the pros and cons of these options against the organisational principles. The best solution may end up looking like Urich’s straw model or it may not. So to me, it’s Accenture’s finding that “blanket ratios and sizing of the function were applied” that is pretty much the root cause of the problem – not the model nor the execution actually. Straight after that I’m following Dave Ulrich back to London for another session on HR supporting social media in the business at HR Performance in London. Dean Shoesmith, Executive Head of Human Resources, London Boroughs of Sutton and Merton. I hope to see you there too. I’ve got more great conferences coming up later in the year. 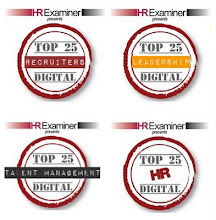 One of these I’m really looking forward to is IIR’s HR Summit in Dubai in November. Dave Ulrich kicks the conference off with a full day on HR from the outside-in and leadership (the why of work). The rest of the programme is the split into sections based upon Ulrich’s HR competencies. You may remember that one of these is ‘technology proponent’ and I’ll be presenting on social media in HR, and HR’s role in supporting the use of social media in business. I’ll then be wrapping the programme up with a workshop on HR measurement. If you’re in the region I hope I’ll see you there. As well as acting as the summit’s social media partner, I’m going to be moderating a panel “THE NET GENERATION—capitalising on unique characteristics” with Ryan Blair, CEO of ViSalus and author of "Nothing To Lose". Aged 36 now I think, Ryan isn’t quite in the net generation I think we’re supposed to be discussing. But then he did start his first company aged 21 and became a millionaire soon after, so he certainly capitalised on his own unique characteristics! Anyway, we’re also supported by Lucian Tarnowski (28?) from Brave New Talent, who as CEO of the social recruiting platform, Brave New Talent, certainly fits the bill. And of course, both of them lead organisations predominantly staffed by net gen employees. Any thoughts on what I should be asking Ryan? Also, I’m still taking entries for a free ticket to the summit – you just need to submit an idea for an HR innovation. This can be a big one – a radically different HR architecture would be great – but it could be quite a small one if it’s interesting enough (perhaps like Ryan’s own innovation in asking interviewees to play Connect 4 with him so that he can understand the way they think!???). Why Ed Lawler is Completely Wrong about performance management! You know I’m a fan of Ed Lawler, right? (see 1,2,3). We’re not talking John Boudreau or Peter Cappelli here (though of course Boudreau is Lawler’s colleague at USC). 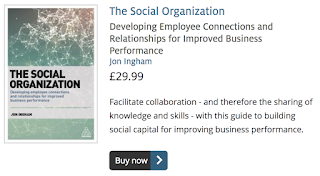 But I’m afraid I think Lawler’s article in the Executive Guide to Integrated Talent Management (featuring me, Dave Ulrich, Marshall Goldsmith – plus Peter Cappelli etc) has got everything pretty much completely the wrong way round. “The existence of an effective performance management system is often the major differentiator between organisations that produce adequate results and those that excel. Without a focus on performance management at all levels of an organisation, it is hard to see how an organisation can find a talent-based competitive advantage. Agreed. And I think these reasons are why an increasing number of organisations are jettisoning their performance management processes and doing something more innovative and resonant instead. But if you are going to do it, it’s important to know the best practices which will tend to stack the odds as far in your favour as much as you can. Me: Well, I understand the logic for this – I’ve even led large projects (£1m+) based upon this principle, and shouted about the case studies which result. But increasingly I see organisations which are just to complicated and complex for this to work. You can’t just start with the top level goals and slice and dice till you end up with every individual taking on their own teeny little bit. Things don’t work like that. So as long as everyone is clear about the overall business strategy, and their own role requirements, they and their managers, and increasingly those other people working around them, are the best people to decide on their goals. Plus of course doing this makes the whole process much quicker and more agile, and less tedious all round. Me: If HR can’t own this, what can it own? (nothing!). It depends on what you want HR to be – if it’s just an administrative side attraction, then fine, just tell it to operate the logistics of the appraisal round. But if you want HR to drive competitive success but ensuring you have the people you need, you’ve got to give HR ownership of some of the key tools. Some of this comes down to the difference between accountability and responsibility. HR can’t be responsible for managing peoples’ performance – that’s got to rest with the line. 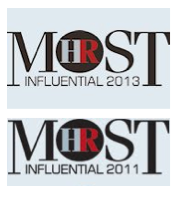 But HR can be accountable for good performance management taking place across the organisation. And owning the system which enables managers to own the performance of the people in their teams is a key part of enabling this to happen. Me: I would ignore the fact that this is really just a repeat of Lawler’s principle 1 except that my challenge is largely the same as my earlier one too. Not everything can be dictated from the top. If nothing else, it’s not very compelling to be treated like this ie as a small cog in part of the big organisational wheel. It’s often better to let people come up with objectives they’re going to be committed too, even if they’re not directly aligned with those of the top cheese. See my post on performance leadership for more on this. Me: Yeah, measurable’s nice, as it helps understand how people are doing and how much to pay them. But this is about performance assessment, not improvement. And improvement comes, once again, from making goals compelling, not merely measureable. See my earlier post on making objectives MUSICal, not just SMART. Oh good grief – get people to set these themselves. Then they may actually own them and do something about meeting them. Me: Yes, but you can’t accurately compare people’s performance at higher levels either. Nobody’s performance, goals or their job is the same, so you’re comparing apples with oranges whatever you try and do. Anyway, it’s not the ‘information’ that’s important here, it’s the conversation. The value of ranking, and why I suggest organisations do it, is the conversations between managers about what they value in different people and why they perceive some as more valuable than others. I’ve never seen the same quality of discussion take place over simply rating people. I4CP can show that it’s apparently less popular, but personally, I’d still do it. Me: Yes, that’s probably true, though GE never forced this to the extent that the story was spun. Anyway, you get round the problem by rating and ranking people. So they get rated based upon their objectives, and ranked against everyone else. If they’re performed well against their objectives but their colleagues have done even better (ie the bar has been raised) they’ll get a good rating but be ranked rather lower. I can’t see the problem in this. I almost have to agree to this one, but there is a way round doing so. Recognise the need for emergence – if you have to train people (on the system, not just having good quality conversations) then the system is too complex. keep the bureaucracy light and just let it happen. Managers and employees will find their own ways to manage and improve their performance. Me: I certainly agree that there’s a problem here – put simply, if money’s involved, people won’t discuss their development needs (weaknesses) because they think it’s going to result in them being paid less. So they pretend they don’t have any needs, only strengths, so no, or at least less, development needs get identified. But I think Lawler is completely wrong to go with the reward vs the development aspect. Firstly because we know reward doesn’t motivate that much. And secondly, because it definitely doesn’t improve performance (by very much). So use performance management to drive learning and development – both key drivers of improvement in any organsiation. And figure out something else (like this) to provide a basis for reward. Again, a bit more of a difficult one to object too, but it’d be a shame to give up now…. so of course I need to note that simply appraising managers isn’t really going to be anything like enough. More important is finding people to work as managers who are motivated and competent to manage. And then you won’t have to worry about appraising them. For a while I thought this would be the hardest principle of the ten to challenge – but then I saw my way through it. Don’t consider – just do it! This isn’t so much for the sake of being more ‘functional’ (“it gives individuals a chance to think a bit before they make their responses”) however, as Lawler suggests – it’s because online provides better clarity, sharing and memory than doing it any other way. Simps. There you go – sorry Ed! 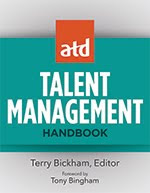 Mine is actually the next chapter after the earlier ones I have already reviewed outlining the general benefits of integrated talent management, and on the integration of learning with recruiting. “Ensuring the alignment and integration of L&D and reward as well as other management policies, processes and practices is an important enabler to effective talent management. There is firstly a need for horizontal alignment – ensuring that both L&D and reward, along with other elements of the HR and management architecture, are linked together and support each other. However, it is even more important for an organization to ensure vertical alignment, which it achieves from having both L&D and reward, and other processes, aligned with the overall business strategy, and its mission, vision, values and so on. For example… some organizations believe strongly in formal systems and structures whereas others prefer informal and social ways of operating. The first form of organization is likely to have set learning curricula for each grade and level supported by a Learning Management System. Organizations subscribing to more informal approaches are likely to put greater emphasis on opportunities for connecting with others in the organization and for self managed learning. An organization’s reward strategy should also be aligned with these approaches to learning. For example, a formal learning system is likely to work best when supported by a formal incentive programme and an informal or social approach to learning may work best when linked to a looser recognition programme allowing and encouraging managers and employees to express their appreciation for exceptional effort, skills and performance. “Compensation & Rewards is interrelated with almost every functional HR domain, but its relationships with L&D is special, yet underestimated. It is special because L&D’s role is to enhance employee competence, to bring about behavioural change, and to develop employees’ ability to work more effectively. Yet development programs all too often fall short in producing the desired change – and not because these programs are badly designed or delivered. In fact, many of them receive very high ratings. So what was the problem? Karl-Heinz goes on to describe some great example of how Hertz has tried to ensure better integration from this point. However, despite what Karl-Heinz states, I don’t think C&R does have much of a special relationships with L&D – certainly not to the same extent as between C&R and Performance Management, and PM and L&D. I’m going to continue (and this time, complete) reviewing / providing extracts from these other relationships / the other chapters of the book over the next couple of weeks. Next Monday, 14th May, I’ll be talking on Bryan Wempen and William Tincup’s blogtalk radio show, DriveThruHR - and I’d love for you to call in or listen online. The show is at noon central time – which is 6.00pm here in the UK, so it’s a tea-time show really. And it lasts thirty minutes. If you miss the show, you can listen to the archive afterward. I’m not sure what I’m going to be talking about yet… and the truth is, I don’t have problems sleeping. Singapore Human Capital Summit in September? Writing a couple of guides which are well past their due date. Do let me know if there’s something particular that you’d like to hear me talk about. If not, I’ll probably end up choosing one of the above topics when the hosts ask the question.. The Talent Management Summit – how to win your free tickets! I’ve been promising you the opportunity to win a free place to the Economist’s talent management summit on 14th June. Well, the sub-title for the 2012 summit is ‘the next generation of leaders’ (global, female, net generation and so on) and one of the things I’m hoping to see evidence of is some ‘next generation of talent management strategies’. I believe that if we’re trying to create something different – and we certainly need to – then we need to think, act and behave in different ways as well. This means we need substantially different HR / HCM / talent management processes and practices to be put in place. So, this year’s ticket competition, open to all talent management practitioners, is going to be pretty simple – what are you doing / what are you already planning to do (/ I might even be prepared to take a look at what you’d love to do if…) – in order to recruit, manage or develop your next generate talent – that involves a degree of uniqueness, creativity and innovation? The best two entries get to go along with me to the summit. Well, you can either email me at: info [at] strategic [dash] hcm [dot] com. Or you can add your entry in the comments below. The advantage of doing this is that other readers may comment on your entries to – and if there’s a sufficient groundwell I’ll decide on the winning entries based upon these comments as well as my own judgements. But I will need to know how to contact you. No word limits or anything like that, and creativity in how you submit your entries, as well as their content, will be welcomed! I’ll include the winning two entries as posts on my blog, and if possible, would like to encourage the two winners to add posts on their reflections on the summit too. The deadline for entries will be 31st May. Any questions? – ask below. Oh, and if you don’t win, or for some reason don’t want to enter (and I might add that odds of winning a £1,300 prize, and great one day learning and networking experience, are probably going to be amazingly good!) then do remember that you can still get a 15% discount by quoting SHCM when you book. Right, to finish this little mini-series of posts on talent management, here is further advance warning of the Economist’s 2012 Talent Management Summit, www.­thetalentmanagem­entsummit.­com. WORK GROUP: ENGAGEMENT—does your CEO know what makes your organisation tick? Looks fine, and I certainly agree with the need to reposition HR, but the sub-text is about business-driven HR – and personally, I think there’s a better way! That’s fine too. It’s a point I’ve been meaning to make in response to one of the most interesting articles I’ve read this week – which has been a piece by HR Magazine on HR’s evolution. There are a couple of calls in here for HR to unify its sense of direction, eg Diageo’s Christian Horne suggests: "The more I work in HR, the more I discover a distinct lack of common definitions." To me, that’s a good thing (see The Head of Talent Role: Challenges and Opportunities for talent Managers /4). 2. As a valued follower of Strategic HCM blog you are entitled to a 15% discount. Simply quote "SHCM" when booking. You’ve also got a chance to win one of two free tickets to attend the Summit and I’ll be posting details on this here tomorrow!